A teaching union has condemned government plans that could see 60 Birmingham head teachers sacked and their schools turned into academies. Prime Minister David Cameron revealed his plan to convert “coasting schools” rated as “requiring improvement” into academies under new leadership in his manifesto. Mr Cameron is now moving fast to capitalise on his General Election victory by introducing key elements of the strategy as quickly as possible. The move to force schools to become academies – described by the Prime Minister as an “all-out war on mediocrity” – will be part of a raft of legislation announced in the Queen’s Speech next week. Only schools able to prove they have a clear plan for ‘rapid improvement’ would remain under their existing leadership. 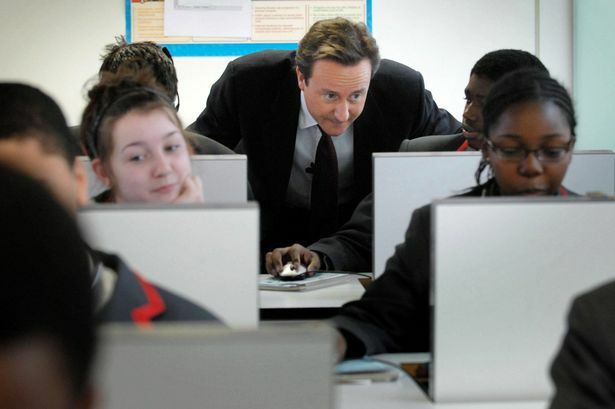 Otherwise head teachers would be removed and replaced by ‘superheads’ from other ‘outstanding’ schools, said Mr Cameron. Currently, only schools rated as ‘inadequate’ can be forced to become academies. But union officials slammed the move, claiming academisation was not the ‘magic answer’. Anne Brimacombe, Birmingham secretary of Rednal-based NASUWT, said: “There’s no evidence that academies improve education, it’s just a changed structure, it doesn’t make a difference to teaching and learning. The news comes a month after head teacher Glen Alexander criticised the Tory plan, which would see his school – Archbishop Ilsley Catholic School in Acocks Green – being converted into an academy. He said his school had improved “hugely” since it was deemed to be “requiring improvement” when it was last inspected in July 2013. He said the school was improving “rapidly” with a 20 per cent leap in academic attainment results. Last year, 67 per cent of its students gained at least five GCSEs at A* to C grade, including maths and English. The school is working with Ninestiles Academy Trust and The PiXL Club – a collaboration of school leaders – to turn it around. Academies are state-funded schools, which receive their money directly from central government, not local councils. They have more freedom than other state schools and can set their own curriculum, term times and even pay and conditions for teachers. Meanwhile, concerns have also been raised about the decision to appoint Colin Diamond as the new interim executive director of education at Birmingham City Council until current director Sally Taylor leaves in the summer. Mr Diamond was dispatched to Birmingham by education secretary Nicky Morgan to support the work of commissioner Sir Michael Tomlinson – with responsibility for helping academies recover from the Trojan Horse scandal. But sources have expressed fears that Mr Diamond, formerly the head of the Department for Education’s academy education advisers division, will push for an increasing number of schools to become academies. David Room, general secretary of the Birmingham branch of the NUT, said he would prefer struggling schools to be boosted with help from other outstanding local authority-controlled schools rather than see them being turned into academies. “We look forward to working with Colin Diamond and in particular exploring how the local authority could further develop school-to-school support for any schools in a difficult situation without those schools needing to convert to an academy,” he said.